The information sign at the Xung Khiem Pavilion on the grounds of Tu Duc’s Royal Tomb in Hue, Vietnam says it was, “requested by the emperor for the enjoyment of fresh air, the scenic view and as a place to compose poetry.” Tu Duc Royal Tomb is unquestionably one of the most luxurious and extraordinary royal mausoleums. The tomb, constructed between 1864 and 1867, was so luxurious in fact that the emperor apparently never wanted to leave and designed it for himself to use during his life and after his death. And what a life it was for the barely five foot tall emperor! 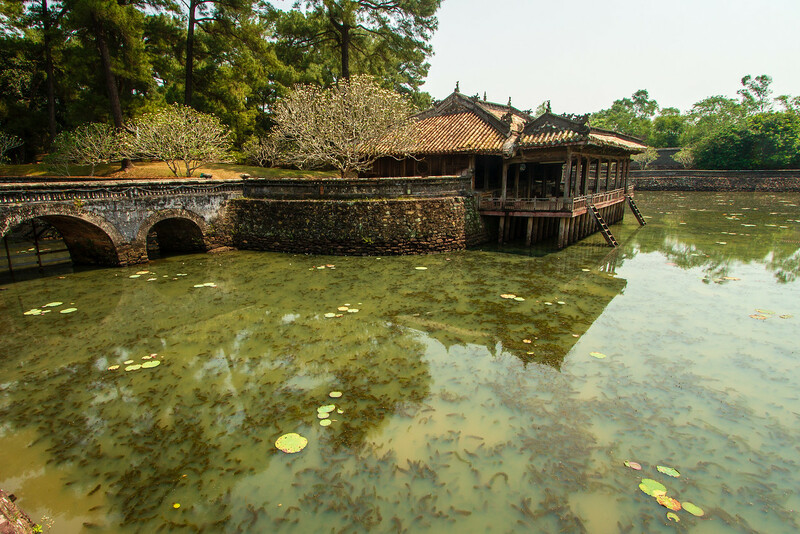 Tu Duc had 1five-foot countless concubines and no children. One wonders how he had time for poetry. I made this image on my Vietnam adventure with my Canon EOS 7D 18 MP CMOS Digital SLR Camera with the Canon EF-S 10-22mm f/3.5-4.5 USM Lens. 100 ISO, 10mm, f/9.0 1/100 sec. Well, that could explain why he did relatively young…exhaustion! Beautiful architecture – very Zen, very nice, I want to be there. Looks great indeed. Definitely worth visiting. Thank you Tina! It is a remarkable place. I looks like Tu Duc had a pretty great time there!